While this discussion was perhaps one minute in a three-plus hour event, I felt like I had been pierced through the heart. Not only do I know what it is like to have people not believe that you are ill, or that you are as bad off as you are, I also know what it is like to put on a “healthy” persona but also to lose your ability to express because illness has taken it from you. So while this probably won’t surprise too many people — after all I am The Sick Chick — I’m going to be painfully honest about it in ways I don’t usually do anymore. People on the internet usually turn away and don’t want to hear sob stories about sick people, but it needs to be shared and I hope that in the telling I can reach even one person who doesn’t already get it. I used to be a professional journalist, before I went to law school (which is even more writing). While in law school I became an editor of several official university publications, including the uni magazine and some academic journals and books. My hobby was online games; this was in the day before the pretty graphics, where my flavor of online gaming was just telling collaborative stories, acting out your own character’s part in the midst of other characters and storylines, all in text form. It was just a form of fiction writing. This hobby consumed more than a decade of my life and led to professional writing gigs in game books and magazines, but more importantly it meant I was writing up to 16 hours a day, and that was on my days off! In 2005, the same year that Hannah quit, I had to give up online gaming of that sort because my hands could not manage to type that much and voice dictation software was not advanced enough for that heavy a usage. I cannot begin to describe the hole in my heart, that I feel even now. I still have nightmares from time to time of seeing text roll up the screen and my hands can’t keep up with responses. I consoled myself then with blogging, which I had begun in 2001. But by 2009 even that was becoming difficult. Keeping up with reading other blogs, commenting, replying to my commenters, etc. was draining. I loved it, I loved the people, but I just couldn’t do it anymore. I was experiencing cognitive decline, for reasons we’re still not sure of, and my mind just couldn’t process everything. Again, another hole was ripped out of my heart. I moved to Twitter full-time (I’d been on since 2007) because my cognitive powers could allow me 2-3 sentences and short back-and-forth conversations — perfect for the tweet — but anything more than that was a challenge. 2012 I tried to take up blogging again. I started well enough, and even wound up writing for other blogs and publications. But within just a few months the anxiety of deadlines and the fact that it was taking me four times as long as my colleagues to produce the same work led to countless hours of tears from frustration, fear, and anxiety. Since none of this work was a real paying gig I felt I had no choice but to give it up or risk triggering a full depressive episode (I am bipolar). Around that time even Twitter became hard to manage and I stopped being on it countless hours per day and it slipped to just an hour or two at most. August of 2012 led to the lowest points ever in my writing ability. I went on a medication that helped my body but sucked out my mind. It crept up on me gradually, so while I knew I was struggling more and more with memory and writing — even reading my email was out at this point, let alone replying — I didn’t associate it with the medication at first. It got to the point where I had an incredibly important document to produce and it would take over an hour to write a single sentence. There are no words that can truly express the despair I felt, and the anxiety and fear of not getting this document done on time. My brain was more broken than ever before and I couldn’t even communicate with the outside world. I was trapped in my bed by my body having a flare that lasted four months and I was trapped in my head by the combination of my cognitive impairments and this drug that was robbing me of the very last dregs of my ability to speak and write. Remember, now, that I used to be a professional writer. Maybe then you can imagine how I felt that once again, having lost a great deal of the functionality of my body, now I had lost the use of my mind. Again, there are no words to adequately describe this. I felt utterly useless as a human being and like I would never achieve anything ever again. My dreams of founding a charity to bring the healing power of creativity to other chronically ill adults seemed completely impossible given the state I was in. Fortunately, we realized the negative contribution the medication was making and I was able to slowly taper off of it over a period of months. It’s been almost two months now since my last dose and I can feel synapses firing properly again. It is still a huge struggle to write; I have no idea if this blog will ever take off again, but as I will explain in a later post so much of success in the directions I want my life to now go depends on me being able to write consistently and with my former skill. I have a psychiatrist who is working with me to try to reverse the cognitive impairments, but it will be a long road and there are no guarantees. I used to have an IQ of 152, but I am fairly certain that if tested now I’d at best test as average and on my worse days probably below. That is a heartbreak that also cannot be explained in words. It is a howling wind of pain that blows through my soul every day. It is a grief that does not heal. There is still what I call the invisible wall that comes between me and my words. I *want* to speak out, but so much of the time when I try I feel myself slammed against some invisible barrier that stops me dead in my tracks. I’ve gotten so used to this wall that it doesn’t make me cry every time anymore, indeed I just accept it as part of what I have to go through just to live. But I wanted to let you all know that it is there. To know that when you do hear from me, as I sincerely hope you will more and more in days to come, that it is not easy. But I also believe in the power of art and writing to heal, so I am going to attempt to tackle this wall with brute force. I hope you will hold my hand through this process and also forgive silences when the wall stops me. I know I need to build my “platform” in order to do the good that I want, in order to establish my charity on sound footing, because without platform there is no support and without support I am only one voice, barely squeaking out a few notes into the wind. Please bear with me. And please consider helping me with my charity efforts, as I will outline again in my next post (To Crowdfund a Charity or Not?). As inspired by @amandapalmer, I am asking. I can’t do any of this alone. I need you all to help in my journey. Thanks for your time in reading this. If anything was unclear, or you want more information, please ask. But please also keep in mind that it may take me a few days to reply. My brain can only do so much in any day. Thanks. I had some strange health issues this summer, compounded by my insurance company being every bit as obstructionist as I had been warned about. (I really did not miss that while I was out of the US!) On the bright side I had a wonderful visit from my Australian sister-in-law and got to know many of the local Austin craft stores and I will be starting a new website about Austin craftiness soon. Sadly, I have had to discontinue writing for CraftTestDummies. The reviews were causing me a lot of stress and taking me about 30+ hours each and since they were every other week that was just too much on top of health problems and international guests and settling in to a new life. I’m very happy to be a member of the Austin Fiber Artists guild and I will be writing about my adventures with them soon. I’ve got my studio almost set up the way I want it, plus a photography area so I can finally show you more of what I have been working on. I’ve been doing a lot of classes on Craftsy and I am signed up for more classes than I can count locally so there will be a ton to talk about very, very soon. But this week I still have to finish up with a number of medical tests that the insurance company has finally (after many weeks of negotiating) approved and finish organizing my studio. Posted on August 27, 2012 Categories AnnouncementsTags Austin Fiber Artists, Insurance, Sara NaumannLeave a comment on Huzzah, I am back! Life has been so incredibly busy that I haven’t even had time to craft, let alone blog about crafting he past few weeks. It’s actually making me mentally itchy and I am jonesing for a bit of knitting, which I hope to get to tonight. Moving took its toll on my body, as I sort of expected, plus I am struggling with the bipolar again. You’ll hear more about that soon as I have a big project planned that is inspired by this. 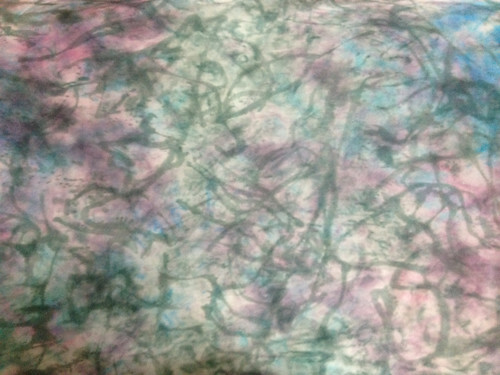 Posted on June 1, 2012 Categories AnnouncementsTags bipolar disorder, Craft Test Dummies, moving, Tré La CreatvityLeave a comment on Long time, no see! Welcome, Crafty Quickies guests and my loyal readers. 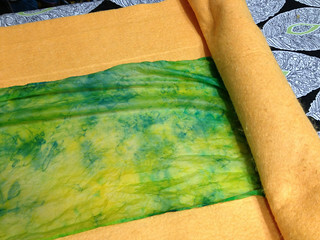 As my contribution to the Crafty Quickies (crafts in 15 minutes or less) series, I present a tutorial on how to use the “bread bag” dye method with Colorhue instant set dyes (yes, really, a dye that does not require heat setting or lengthy waiting!) 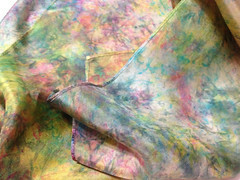 to dye a silk scarf. 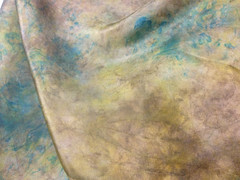 You may want to see my tutorial on how to mix the dye solution and my examples of several scarves and other things I have dyed with this method. 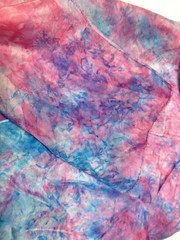 Colorhue works best on protein fibers and rayon, other fibers will have a much less saturated effect. 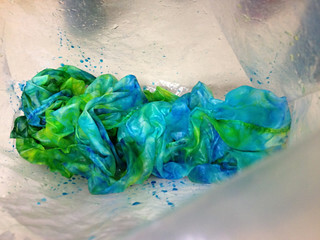 “Bread bag” dyeing (a form of low-immersion dyeing) is where you take some fabric and scrunch it up into a plastic bag, then apply a small amount of dye to the exposed parts of the fabric. 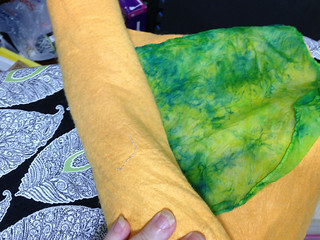 Squish the fabric to ensure that the dye discharges (gets absorbed by the fabric), open the fabric up, scrunch it again with different bits showing and add dye again. That’s really all there is to it, but I’ll walk you through every step. Oh, and I don’t use a real bread bag as I like something a little more sturdy; I use a freezer bag because I know I can really squash it up without worrying about it springing any leaks. I’ve used the same bag over and over for about 20 projects so far and it’s still going strong. First, you’ll need to get your scarf thoroughly wet. You can do this in the sink but I had some water on hand already. Release some tension, give it a good squeeze! Now open it all back up. Now be a little more deliberate. 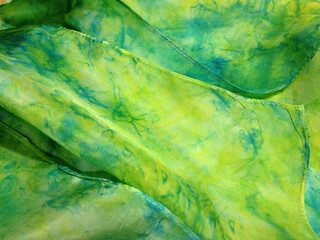 Scrunch up the fabric along the length, I usually grab about a handful and scrunch, then another. You want it to be fairly even all the way along but you really don’t need to fret over it. 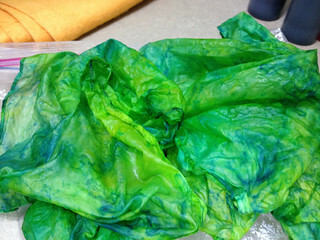 Bread bag dyeing is all about serendipity so don’t overanalyze any part of it. 🙂 Think of this as a very haphazard accordion fold: you’re just trying to get some parts to stick up on the top, some parts to poke out on the bottom and the rest to be in the middle. This helps each color be more or less evenly distributed throughout. 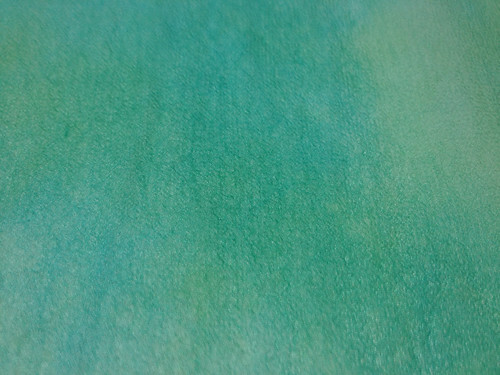 If you choose to not scrunch you’ll get larger puddles or pools of one color rather than lots of little ones. 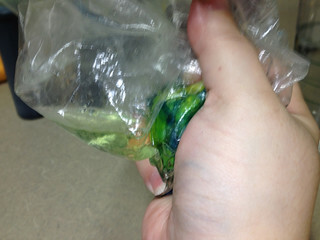 Once it is scrunched, place it gently into the bottom of your bag. Now the fun begins! 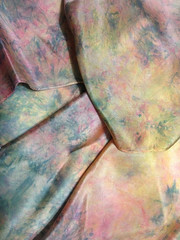 Squirt or pour a little dye onto the top of the fabric. 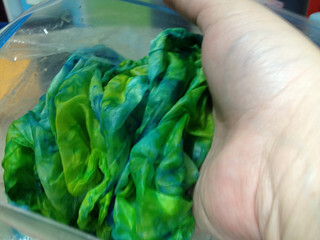 Not too much, you don’t want the fabric to be swimming in dye just yet. 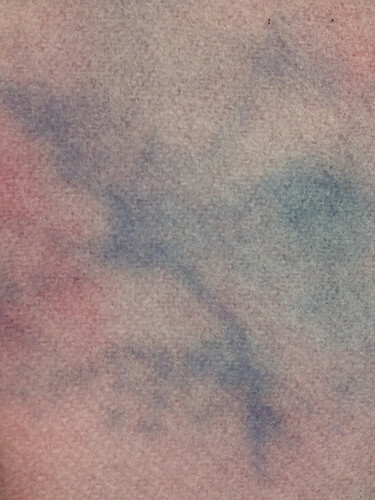 You just want enough dye to cover the exposed area. Oh no, has the whole thing gone blue? 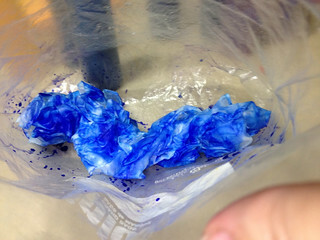 Look through the side of the bag, you can see there’s a lot that does not have any dye on it yet. You’ve only gotten started. 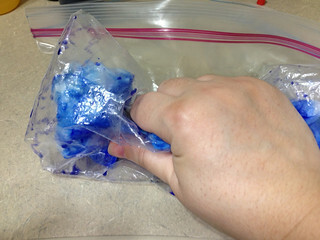 Squish it from the outside just a little to pick up those stray drops of dye. 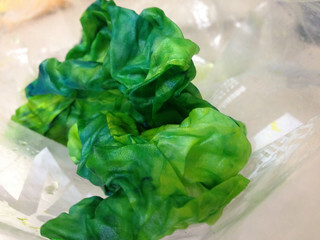 Scrunch, dye, squish — that’s really all there is to it. Add more dye until this side, too, looks fully colored. Don’t worry if there are some white bits showing, they’ll get taken care of later. 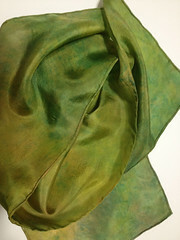 Grab the fabric from the outside of the bag and give it a squeeze. 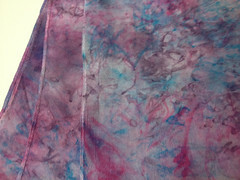 You’re trying to get any loose dye to go on to and get absorbed by the fabric. 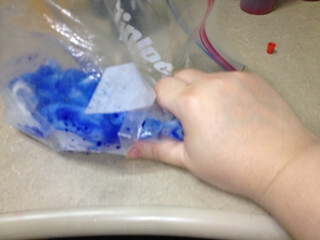 Just give it a few squishes and also move it around so that it picks up any droplets of dye clinging to the side of the bag. More white fabric, just waiting for color! Go on and add your second color. I’m using yellow. Watch it change before your very eyes! Once again, cover the whole top with the new color. This time you don’t need to turn the fabric over. 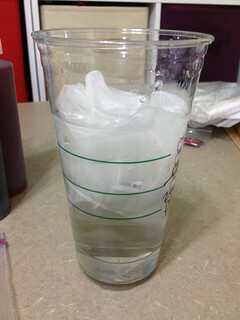 You’ve got enough liquid in there and also unless you were really overachieving, you didn’t try to get a lot of white showing on the bottom, just the top. So it’s time to squeeze. 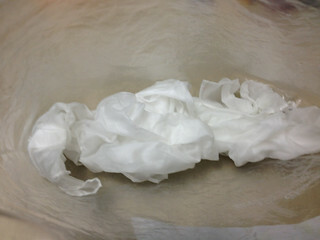 From here on, when you squeeze you want to keep massaging the fabric until the water is mostly clear. It doesn’t usually go all the way to clear but you want it to be very pale. 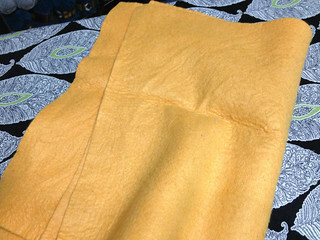 You may have to squeeze the whole scarf down into one corner just to be able to see the excess water at this stage. You can see the excess water on the left side of the bag. That’s what I mean by “mostly clear”. Again, you could stop here. There’s absolutely nothing wrong with white being part of the design. 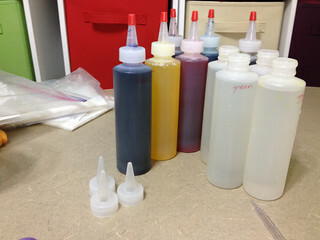 But I’m a glutton for punishment, I generally do 3-5 rounds of dye. So it’s time to scrunch it up, once again targeting the white areas to be hit by the next lot of dye. And squeeze. The water seems even clearer than the last round. 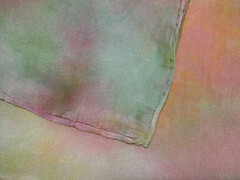 The dye can get absorbed at any point when it meets fabric that can hold more. Just a bit of bluey-green tinge, not bad! Some of the brightness of the second photo might be because I fixed my clip-on light to shine into the bag better. But I do think that the second picture has a lot more yellow in the tones overall. Maybe I’m just high on dye fumes… on no wait, there is hardly any odor to the dyes at all, only my cat seems to be able to smell them (she usually come to watch, I have no idea why she is so fascinated with these dyes). Anyway, I liked the effect, and I knew that the white was now all covered with color. I decided to add a touch of that darker green after all. 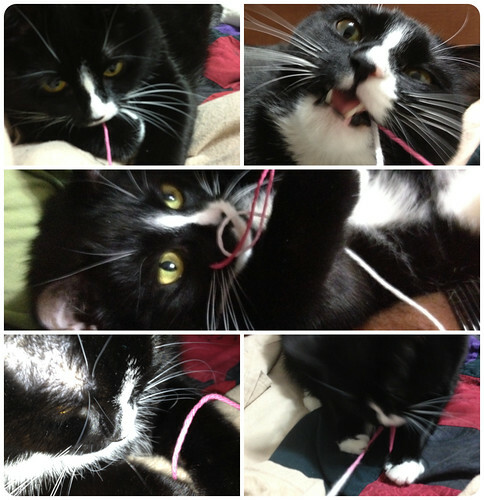 But I won’t bore you with the pictures. As I’ve said, you can stop at any point, or you can keep going. 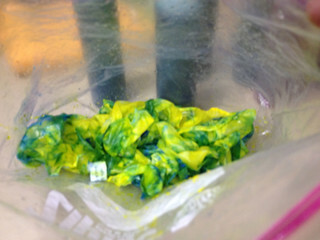 I’ve done as many as 7 rounds of dye in one go, without drying it out in between. 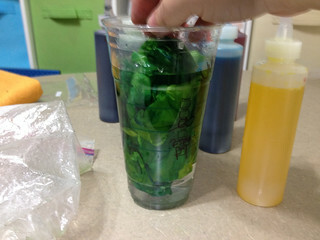 So as long as your water is mostly clear at the end of the squeezing part you can always try to add more. 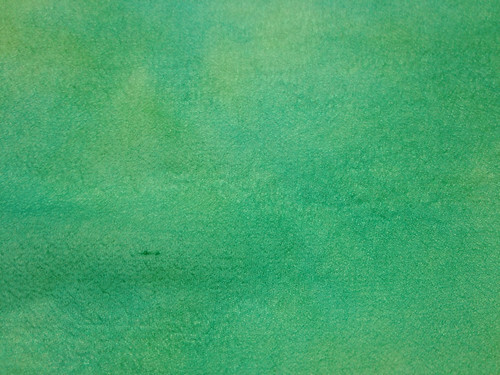 I don’t use more than 4 colors though as I fear they would blend too much and get very muddy. You can always try it and see! 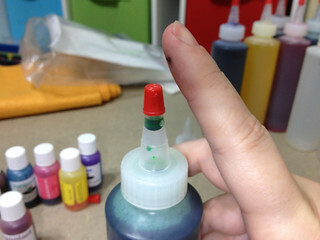 I just think that other dye methods would be better if you want to have more than 4 shades clearly distinguishable. 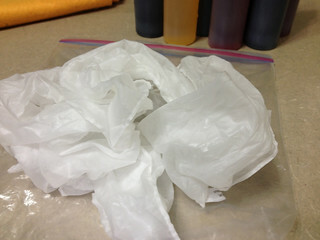 After you’ve finished squeezing, it’s time to take it out of the bag for the last time. At this point you could call it all done. 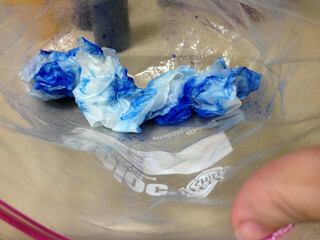 With the bread bag method there is not a lot of undischarged (unabsorbed) dye left, so you’re not going to have much run-off when you wash it the first time. I don’t usually rinse, but this time I had water handy anyway, so let’s go for it. When I wring it out I can see that there is a little tint to the rinse water, meaning that I did have a little bit of dye come out. 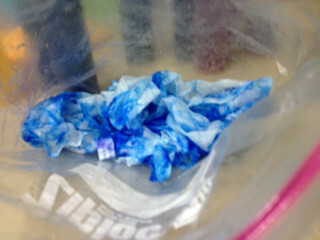 But actually some of that tint was already there when I had used the water to rinse out my eyedropper when I was mixing the dye solution. 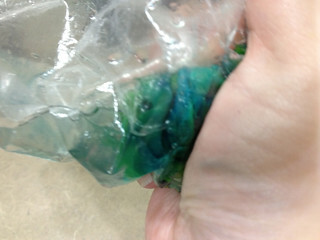 In any case, there’s not a whole lot of excess dye to worry about, as you can see. That’s why I don’t generally do this step. 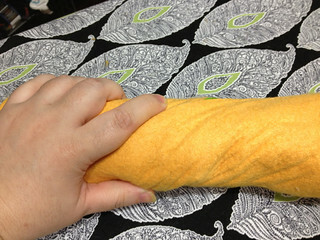 For the speedy gonzales drying method, I grab the synthetic chamois. 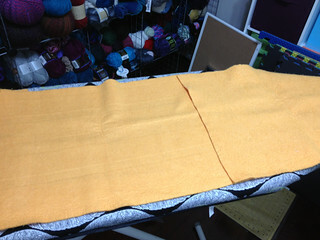 Lay out the chamois on your ironing board, overlapping just slightly so there are no gaps. It's a wet scarf on a chamois on an ironing board. Woo? Once it is rolled up, give the whole roll a good twist. Wring it out. 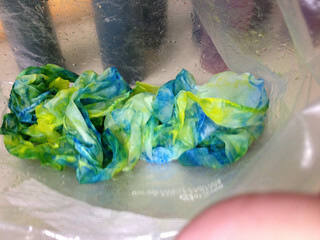 The goal is to get the excess water out of the scarf and into the chamois. You don’t have to be very gentle, unless you have some incredibly delicate fabric, because the chamois will absorb most of the force. Now unroll it, so that the scarf is on top and the chamois is against the ironing board. This is probably the hardest part and it’s somewhat optional. I just like to make sure my ironing board cover doesn’t get wet, especially if I am doing a lot of scarves in one session. But at this point most of the water is in the chamois so it doesn’t matter too much. If I was smart I would have told you to turn on your iron at the point where you get out the chamois. I usually forget to do that though, so insert a few seconds here for it to warm up. Use the hottest setting your fabric will allow. 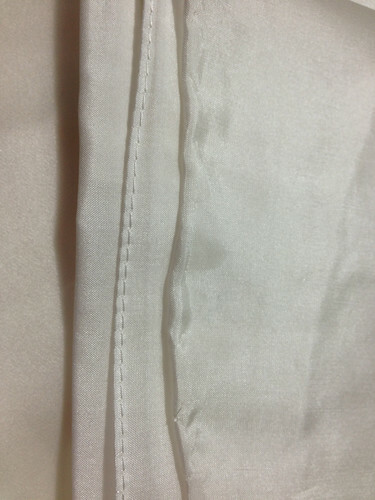 The ironing will dry the fabric and remove the wrinkles at the same time. Handy, eh? The eagle eyed among you may be able to spot the area that is already dry. 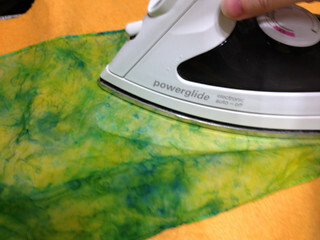 See how much lighter the colors are just by the iron? 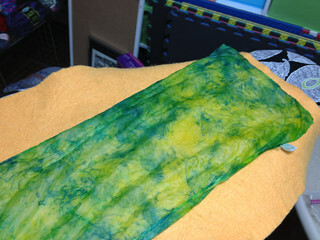 The colors really get lighter as the scarf dries. It can be hard to see against the dark background of the chamois though and even harder if I was doing it directly on my black ironing board. The left hand side is wet and thus darker. 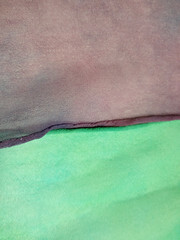 The right hand side is lighter and the silk has regained its natural luster, reflecting even more light. And now we are done! Here’s a pic of the scarf on a white background. Unfortunately I don’t have a light tent so you can’t see the full effect but hopefully you can tell that there is actually yellow showing, or only a slightly greenish yellow, along with blues and greens. Success! I hope you enjoyed this tutorial. Do come again sometime. 🙂 Meanwhile, if you haven’t been there already, you may want to head over to the Crafty Quickies Roundups for more 15 minute craft ideas over at Moore Craft Time. Thanks for stopping by! Feel free to give me a shout if you have any questions. 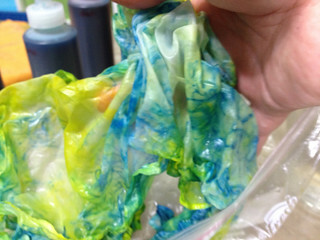 I’ve only been playing with this dye for two months or so now but I think I have the bread bag method mostly figured out, so I’ll do my best to answer. 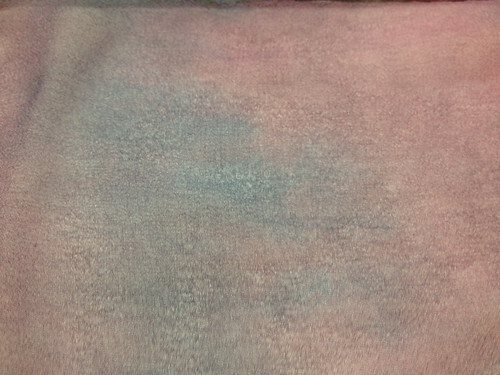 Colorhue dye by Ginny Eckley is safe, non-toxic and sets instantly on protein fibers: there is no need to heat or leave it to sit for days and you don’t need a mask or special equipment when mixing up a batch of dye. 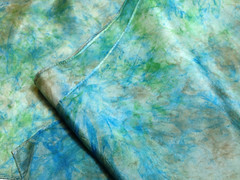 This makes it a fantastic dye for impatient people like myself! 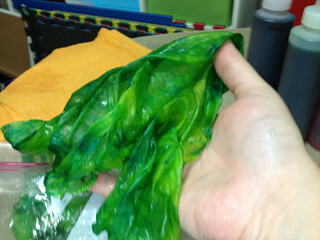 But you do need to prepare the dye in advance by diluting it with filtered or distilled water. 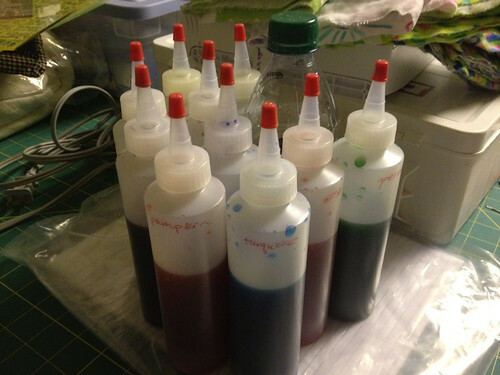 Once you get a set of diluted dyes mixed up you can do several projects (about 15 scarves for my set of bottles) before you have to stop and mix more, so again, great for the person who likes jumping in quickly and seeing the results fast. 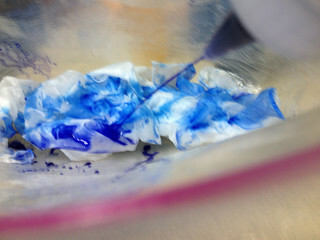 You’ve hopefully seen my post about the fun I have been having with Colorhue instant set dyes for protein fibers. I’ve discovered a few things (finding out the hard way) that make the prep stage easier so I thought I’d do a little tutorial about how I mix them to get them ready for use. Tomorrow I will be posting a tutorial on how to make a scarf with the “bread bag” method (which is what I used for most of the things I have posted). First off, you’ll need to acquire some Colorhue. You can buy them many places, I got mine from a vendor at SAFF and paid the full suggested retail price of $40 for a ten-pack sampler. 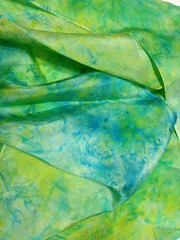 That same Colorhue Sample Pack is available at DharmaTrading.com for $35.99 plus shipping (which is also where I buy my pre-hemmed silk scarves — really if you are a dyer or want to try it Dharma Trading is the place to start, they are cheaper than anyone else I know of and have the best selection of dyes and dyeable fabrics). 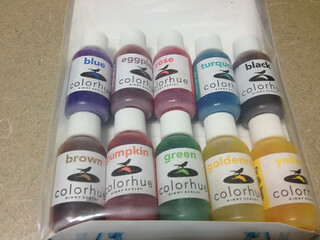 The sampler pack has half an ounce each of the ten colors that come prepared, you can also mix to get your own shades. Please note that there is not a red by default, but these dyes work on the CMYK color system not RGB so although you may have learned that red is a primary color, that’s not the case here. You can make a variety of shades of red by mixing yellow with rose (really a Magenta for the purposes of CMYK). I do wish they’d go ahead and come out with a red, though. 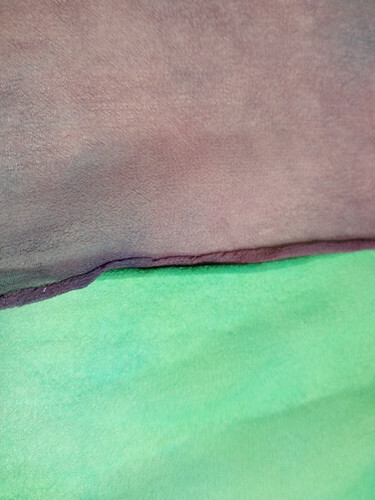 It’s just annoying to have to mix it up all the time as it is a color I use often in my work (I haven’t shown you those scarves yet, I will soon). 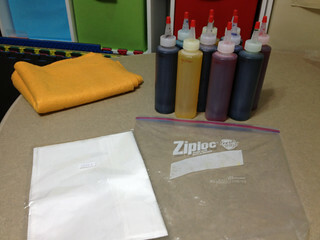 In my experience the sampler pack will dye at least 40 scarves plus assorted other items. It’s a good value if you want to have every color, but it is more economical to buy larger bottles (available in 2 and 8 ounces) if you find you use certain colors more than others. I plan to do that when I start running out of my favorites. Now the directions (on the website, it doesn’t come in the package) say to use 15-20 drops of dye per 1/2 cup of water (4 ounces). I’m far too lazy (and shaky) to count out drops individually. 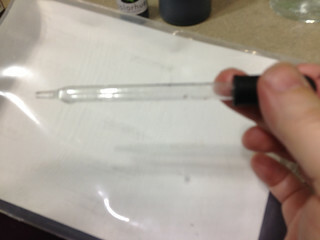 I use glass eye droppers (also from Dharma Trading) and use one full eyedropper per ounce of water. I think this is a little bit more than their 15-20 drops but not by much. This comes out at a medium level of saturation and one that I am happy with. 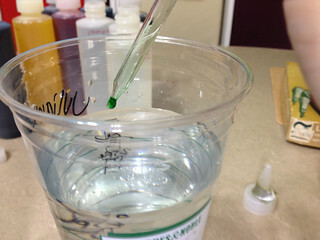 For pastels, use one eyedropper of dye for every two ounces of water. The little bottles out of the packet. They may look small but they are powerful! 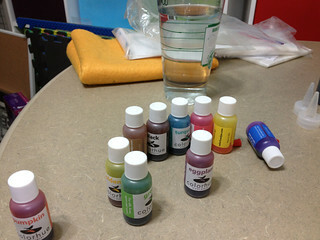 You don’t need a fine squirt tip for most dye techniques, but when doing a graffiti-style direct application it helps, so I can use these bottles for every method I’ve tried so far without needing to change to a different applicator. If you are doing immersion dyeing obviously you will want to have your dyes in a bigger space to immerse the fabric but I find this very easy for the mixing stage and plan to then dump the mixed solution into the other receptacle for the bath. 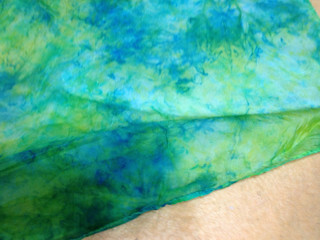 That way I can mix up more dye than I need for a specific dyebath and still have them handy for other uses in the future. If you are doing large dye baths (for instance if you use the whole bottle in one bath) you may not want to pre-mix, you’d add the dye straight to the bath instead. 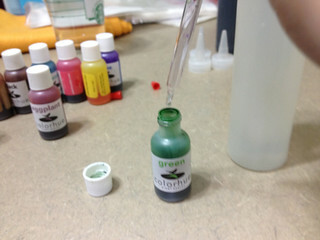 I haven’t done this yet so have no idea what the water to dye ratios will work best in that situation. I’ll let you know when I find out. 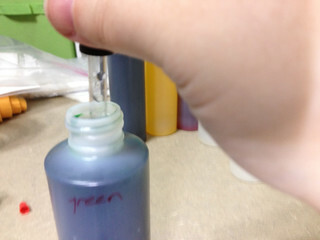 I strongly recommend that you label each bottle with a permanent pen or marker — not only does the sample pack have two shades of blue and two shades of yellow that would be very hard to tell apart with the naked eye but also the purple and black look very similar when in the squirt bottles. 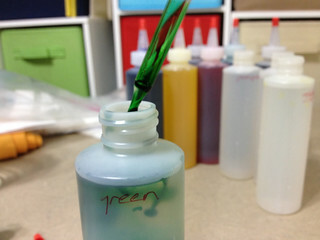 You’ll notice that there is some excess dye clinging to the eyedropper. Don’t worry, it’s not stained or ruined. Because a bit of the concentrated dye clings to the glass, you’ll want to add that to the bottle as well so you don’t waste it. 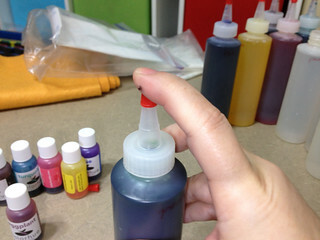 When you have finished adding in the dye, dunk the eyedropper into the bottle. 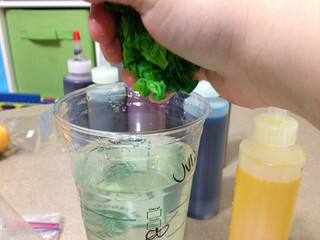 Swish it around a bit to remove the dye from the outside of the dropper, then fill and empty the eyedropper into the bottle a few times to get the dye from the inside. Waste not, want not. 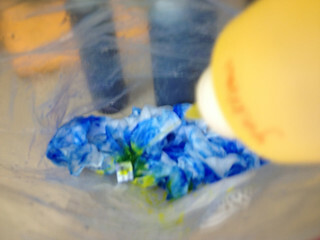 Every little bit of dye helps your colors be more saturated. 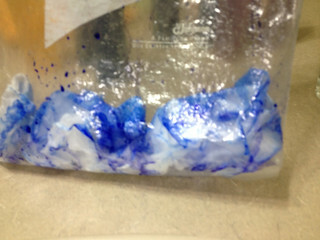 Because you are rinsing the inside with diluted dye, it won’t rinse clean. But at least you’ll have used up the very concentrated dye. See, there's still a little color, but it's less. 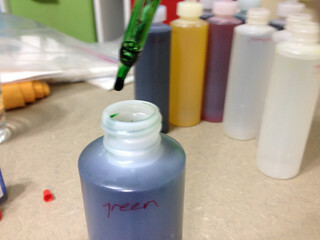 Now you need to clean out the eyedropper before moving on to the next color. So repeat the procedure with plain water. If there is any dye left you'll see a tint here; this one is clean. You can easily see if you forgot to shake: even one little swish will usually leave some stuck in the spout. This also makes it a little bit easier to tell the colors apart without having to read the label (unless it’s those pesky blues and yellows that look almost exactly the same in the bottle but look quite different on fabric). 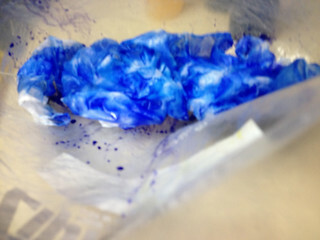 And now you are ready to dye! 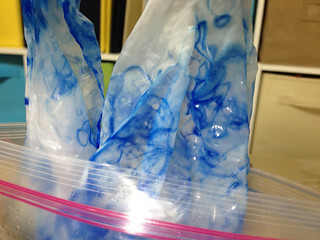 Come back tomorrow for my tutorial on “bread bag” dyeing. 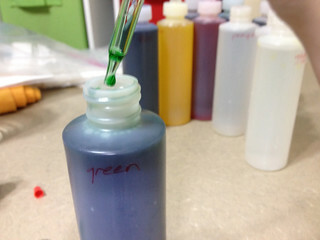 I am absolutely in love with the Colorhue brand of dyes for protein fibers. 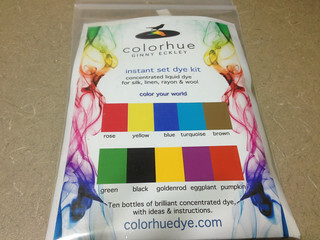 What’s not to love about instant set dyes (no heat or time required) at affordable prices? 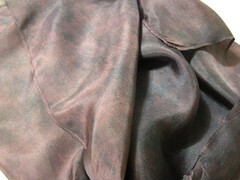 Since I am going to be doing a tutorial later this month on how to dye scarves with this method and a full product review for another site, I’ll just show you some of the results I’ve gotten with this product. I’m utterly addicted! 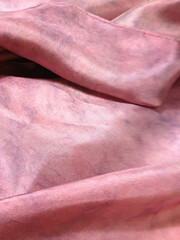 This one (first, pink) was OK, but didn’t go with my mother’s wardrobe, so I went to a more plum shade (second photo). The image doesn’t really do that one justice, the shinyess of the silk makes it look lighter than it really is. So — these are my experiments so far. I can honestly say I am hooked. I’ve already got more wool and will be ordering more scarves as soon as payday comes around. Although I have no intention of selling crafts for personal profits (most of these have been given away already or are waiting to be given away), I am wondering if this might not be a good way to raise funds for my charity. 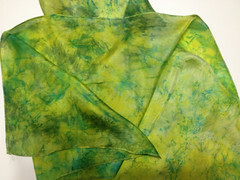 If I *did* sell these scarves, what do you think would be a fair price for them? 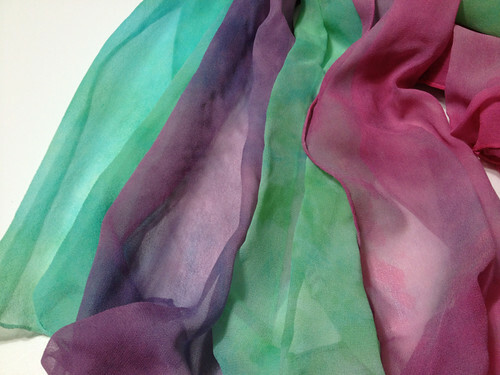 I know that handdyed silk usually fetches a decent amount, fair above what the supplies cost, but I’d like to make them affordable yet profitable enough to help the charity. Suggestions? The most essential things to keep in mind when moving home are to find a city or region with a lot of craft mojo and to find a house that is perfectly suited to your crafting needs. We picked Austin, Texas (having lived there before) which is filled to overflowing with great indie-craft people. Next we found a house. We had the luxury of being able to afford an extra bedroom to be my studio, although in our case with my husband working from home part of the time and me mostly housebound it was less of a luxury than a sanity saver. So I have a bedroom just for crafting and until we buy dining furniture (if ever?) there’s also a lovely formal dining room I can use for say, blocking out large projects or pin basting quilts. Then there is what I consider the best bit: the screened in porch. How many times have you wanted to do something with stinky products and read the directions “Use only in a well-ventilated area” then been frustrated because just opening the window isn’t enough to deal with the fumes? Well I don’t think I will have that problem again. Between the screens allowing full air flow and the fans overhead, I think it would be hard to get any more ventilated in a residential setting! 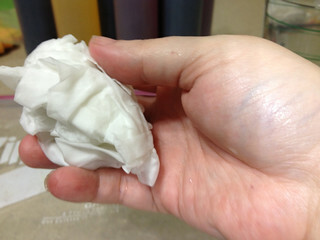 Plus it is a great place for wet felting which can get a little messy as the soapy water sloshes about. This is a rental house so of course I will be careful and use drop cloths, etc., but my mind is already abuzz with the possibilities! Another advantage of this house is that it is only a few blocks from the main library, so anytime I need a little eye candy but don’t want to be tempted to buy anything I can go there and peruse the stacks and I am still allowed to bring things home with me, if only for a little while. So there you have it, Step One is find an ideal residence to facilitate your craftiness. Check! We don’t actually move in until the 19th but before then I will be starting on Step Two: scout out (by internet and especially Ravelry) the craft stores and groups nearby so I can be ready to leap in with both feet as soon as we get to town. Come back next time for tips on how to do that. What do you wish you had in a home that would make your crafting life easier? Do you have any tips for me as I go about setting up here? Advice always wanted! You can find the article by clicking on the image above. Things in moving-land are going a bit crazy. We’re having all of our stuff shipped via a container system so it’s all got to 2 weeks before we do. (It is actually much easier for us health-wise since we only have one able-bodied-ish person to do the actual lifting and carrying and this way we’re not rushing to load or unload a truck in a single day.) My half of the studio I have shared with my mom off and on since 2009 is slowly getting packed away. In some ways it’s embarrassing, as I am faced with just how much stuff I have managed to accumulate. In other ways it’s exciting as I am remembering cool things I own but haven’t seen in a while. If you don’t know much about me, you can wander around this site a bit but probably a much easier way to find out is to listen to episode #92 of the Craftypod, featuring yours truly. I talk about how crafting keeps me going and also why I spend so much more time on Twitter than I do blogging. (In case you didn’t know, you don’t need an ipod to listen to a podcast. You can listen right there on that website by clicking the little grey button with a triangle that looks just like the “Play” button on your CD or DVD player). Whether you are an old friend or new, I hope to hear from you! The tumbleweeds are blowing through this blog like the West Texas desert. All is not lost, this time I do sort of have a good excuse and for once it’s not my health. You may know that for the past two and a half years I have been going back and forth between the USA and Australia as we’ve been waiting for my husband to get his green card and be able to live and work in the US. That time finally came and he moved to the US in January. This past month we’ve been working on packing up all of our belongings and he has found a job already so we’re preparing to move to Austin, TX in the next two weeks or so. I have been crafting like crazy but I have not really had time to blog. However all of the craft supplies have to be packed up and loaded by Saturday (save some emergency crafting gear!) so I’ll have a bit of time to catch up on blogging and introduce you to the many things I’ve been up to. I’ve also recently written a guest blog post for a much larger website on a subject very important to me — so important that I thought it needed a bigger platform than my handful of loyal readers. So now that all of that is done and dusted, regular service on this blog will resume again soon. I have so much to show and tell you all that I almost can’t wait…but unfortunately I must because the movers wait for no woman. I’ll also be starting a small series of blog posts about crafty travel and moving tips on how to find your way around in a new place. I’ll take you with me as I do this yet again for the second time in two years, and I know Austin is bursting with crafty goodness so it should be quite a treat!